Excellent location, clean and fairly large apartment. Spacious balcony with a great view, so that you can enjoy dinner/breakfast outside. One minute walk to the beach. The view from the apartment is just lovely, the room was cleaned to a high standard every couple of days. Plenty of room in the apartment. Just a lovely holiday looking forward to returning. Warm welcome. Pleasant staff. Beautiful sea view from the bay. Cozy apartment with large terrace. Bucataria a fost dotata cu vesela. am putut gati fara nicio problema. Balconul cu privelistea spre plaja a facut toti banii. Гледката е великолепна! Голяма тераса! На плажа може да си намериш усамотено местенце. Апартаментът е много просторен и е на самия плаж. Има чудесен ресторант наблизо - "Infinity blue", с изискана кухня и супер панорама. Das Service und die Kommunikation war ausgezeichnet. Wir vermissten eine Kaffeemaschine und fünf Minuten später kam die Gastgeberin mit einer neuen Kaffeemaschine. Die Lage ist super, mit Blick aufs Meer und direkt am Strand und bei der taverne. Lock in a great price for Kolios Seaside Apartments – rated 9 by recent guests! 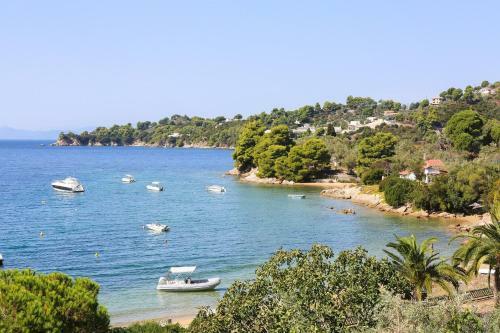 Located right on Kolios Beach in Skiathos, Kolios Sea View Apartments offer self-catered accommodations with a furnished balcony overlooking the Aegean Sea. There are many shops and bars nearby. Apartments Kolios Sea View offer rooms with air conditioning. Each includes a kitchenette with kitchenware and a fridge. All units have a private bathroom with a bathtub or shower. A bus that goes to nearby beaches stops just across the street. The town of Skiathos is 3 miles from the apartments, and the airport is 4 miles away. The famous Koukounaries Beach is 4 miles from the property. 뀐 Located in the top-rated area in Kolios, this property has an excellent location score of 9.6! When would you like to stay at Kolios Seaside Apartments? This studio comes with 2 single beds. 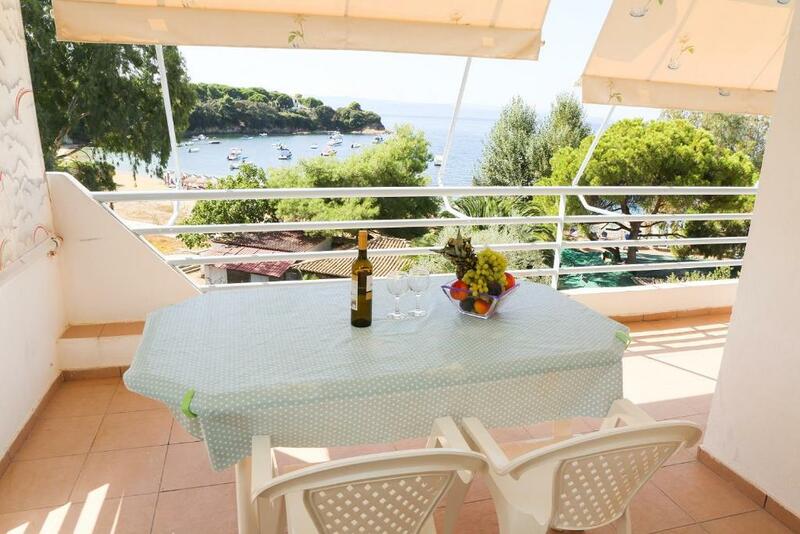 The family apartment consists of 2 seperate bedrooms, a fully equipped kitchen, 2 bathrooms and a large, sea-view balcony. This apartment consists of 2 separate studios. 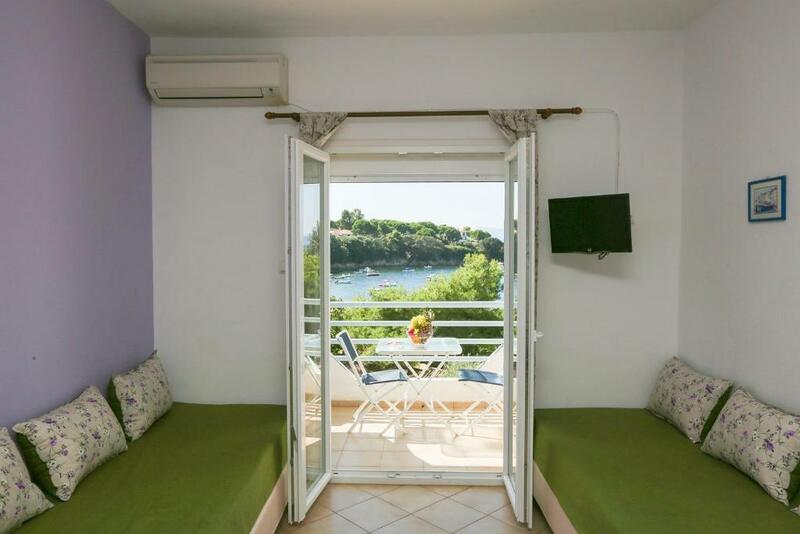 One studio with 2 single beds, a kitchenette, a bathroom and a sea-view balcony and a second one with a living room with 2 beds, a kitchen, a bathroom and a sea-view balcony. The two studios are connected with an internal door that can be locked. The fact that we are just in front of the beach makes us special especially for family with young kids, Our accommodation is ideal for relaxing holidays. Also couples that looking for relax can enjoy our place as the area is very quite and peaceful . 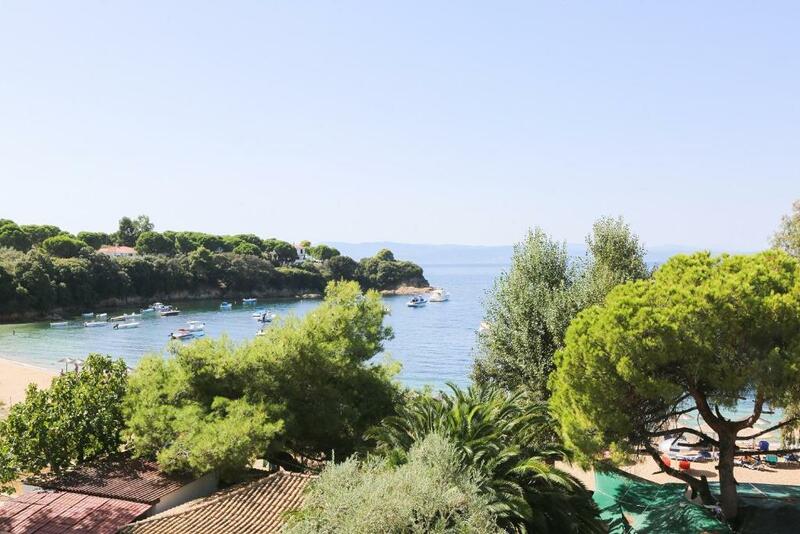 You can enjoy the sun and sea during all day being at the same time very close to your studio. No car is needed but in case that you need to explore the island the bus stop number 15 is a few steps from us..
With great interest and love to the tourist our priority is to make them feel like being home. Kolios area is a peaceful area for those looking for relaxing holiday in front of the beach. There is one taverna just in front of the beach and 2 more restaurants in a walking distance. In a walking distance there is also a market. House Rules Kolios Seaside Apartments takes special requests – add in the next step! Kolios Seaside Apartments accepts these cards and reserves the right to temporarily hold an amount prior to arrival. Please note that 30% of the total amount will be charged anytime after the reservation, and the rest will be paid in cash upon arrival. Please inform Kolios Seaside Apartments of your expected arrival time in advance. You can use the Special Requests box when booking, or contact the property directly using the contact details in your confirmation. Bathrooms, although clean, need some repairs/upgrades.